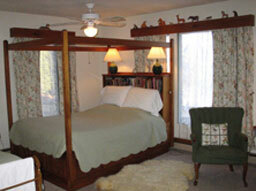 The large Attic Room is great for a family. 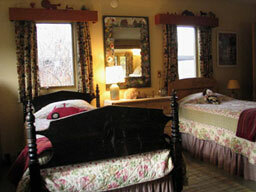 It has a window bed (a double), twin beds, and a private bathroom with shower. The room looks out on the front and side gardens. 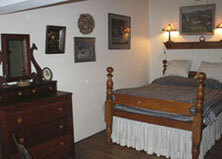 Next door is the Guest Room, the original "spare bedroom" before Homeplace became a Bed and Breakfast. 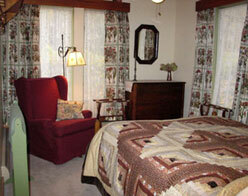 It has a double bed, and a window seat looking out over the front garden. Each of the four ground-floor guestrooms has a garden view, and a unique character. 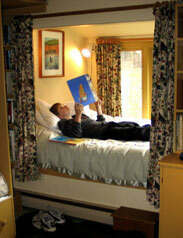 All of them are reached through the inviting Back Hall with a wide array of books for children of all ages. These were some of the bedrooms of a large and lively family whose interests are reflected in the variety of books, puzzles, and games located in the guestrooms, throughout the corners of the living room, and in the hallways. 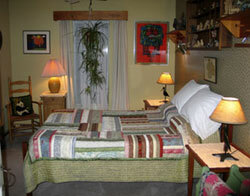 Paula's Room has twin beds and is a comfortable, cozy spot. Margaret's Room has a double bed, a twin bed, a crib, and its own bathroom — making it another great room for a family.